Pocket T-Shirt - HALF PRICE! Gap is an international American clothing and accessories retailer founded by Donald Fisher and Doris F. Fisher in 1969 with a goal to make it easier to find a pair of jeans and a promise to do more. The company headquarter is located in San Francisco, California. The Gap Inc. has been around for 46 years and has become a global business from a single store and has five brands under its belt namely Gap, Banana Republic, Old Navy, Athleta and Intermix. To date, Gap is available in about 90 countries across the world including the UK and operates through 3,300 company-owned stores, almost 400 franchise stores and online stores. 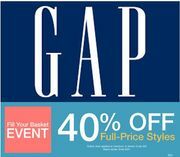 When Gap first started out, it targeted the younger generation, with its name referring to the generation gap during that time. The company first sold product range from Levi Strauss & Co only, but by 1973, Gap begun to make their own jeans to distinguish themselves from department stores. Today, their offerings range from jeans to tops and tees for the whole family. Gap has also reached out to a wide variety of demographic of customers by tailoring its stores to “appeal to unique markets” through the development of numerous formats and designs. Browse through their wide range of women’s jeans, trousers, dresses, tees, tops, sweaters, blouses, swimwear, shoes, accessories and more that you can wear all the time and even match your personality. From keeping it cool for running fast and running around to high stamina game changing gear to arm up your workout, Gap has everything you need to suit every activity you have in mind whether it be yoga, swimming or running. Make your first layer your favourite with Gap’s wide range of bras, knickers, loungewear and sleepwear made from feel-good fabrics that are soft and will provide you with all the support you are looking fro with a touch of a feminine edge. Styles fitted for moms-to-be. If you’re expecting, start building your maternity wardrobe from Gaps’ offerings which include versatile and comfortable dresses to their tried-and-true favourite jeans to keep you still stylish even with your baby bump. Their product range for men includes everything from jeans, trousers and underwear to t-shirts, polos and sweaters to socks, shoes and accessories that you can use from day in to day out. Explore their wide range of products for girls which includes dresses, tees, jeans, shorts, swimwear, accessories, shoes and all the essential pack-alongs for a sunny holiday. Bring your little boy’s fashionable fun side with their range of shorts, tees, jeans, swimwear, polos, shoes and accessories. Your toddler’s outfitting made easy with their no-fuss looks and tot-tested favourites that will make dressing for every season a breeze. Easily plan your baby’s outfits with Gap’s no-fuss favourites and one-and-done looks like bodysuits and one pieces as well as adorable rompers for instant outfits for your cute babies. How do I contact GAP? What are the delivery options for GAP? Gap only ship to addresses in the United Kingdom and are not able to ship to PO Boxes, British Forces Post Office (BFPO), Channel Islands or Isle of Man. Will arrive within 2 business days, pending credit card authorization and verification. Place and pay for your order online by 12pm today, select CLICK + COLLECT in the delivery option. A notification email will be sent to you once your order is ready. For more information, read their full Shipping & Handling page. How do I return an item to GAP? You can return your items within 30 days of your order date. Defective items can be returned at any time. Only available for Products purchased in the UK. All returns for shipments to countries outside the UK must be returned by mail. Returns are free for UK customers: just use the pre-paid Royal Mail or Collect + shipping label included in your package. For more information, read their full Returns page. Bridging the Gap, which was directed, cast, and styled by newly appointed Vogue UK editor-in-chief Edward Enninful, celebrates optimistic American style.